President, owner and founder of the company de GRISOGONO, nothing predestined Fawaz Gruosi to become one of the most sought-after watchmakers and jewellers of his generation. Born on the 8th of August 1952, he spent his childhood in Florence with his mother. Driven by the need to find a job, but also out of interest in beauty and art in general, he left school at 18 in order to train as a sales assistant with a famous Florentine jeweller. Seven years later, the latter asked Fawaz Gruosi to oversee the opening of a new store in London, first as a consultant to the firm, a position that quickly saw him evolve into store manager for a period of four years. At only 30, he was noticed by the Alizera family, official agent to Harry Winston, who offered him the position of representative in Saudi Arabia. Enterprising and dynamic, Fawaz Gruosi agreed to take up the challenge. After three years, he returned to Europe, where he was immediately contacted by the Bulgari company. Gianni Bulgari, a cult name in the world of jewellery, created a new position for him within Bulgari Precious Trading, putting his complete trust in him. He thus became the first within the group to have access to the brand new high-jewellery collections, which he would be responsible for selling worldwide, except for the Bulgari stores, of which there were only eight back then. A fantastic field of opportunities opened up before Fawaz Gruosi, enabling him to fill up his address book with the numerous relationships he built up. 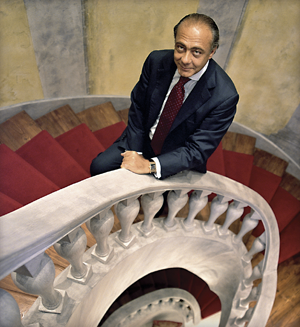 It was a unique and extremely enriching experience, but when Gianni Bulgari left the company, he decided to follow suit and stand on his own two feet. In 1993, without any commercial strategy, he founded de GRISOGONO with two associates. Based in rue du Rhône in Geneva, Fawaz Gruosi offered his customers exclusive art objects and began to express his creativity through inventive and precious jewellery. Shortly after, the de GRISOGONO style took shape through ever more surprising designs and volumes. In 1996, not even a year after Fawaz Gruosi parted company with his two associates, a new chapter opened for de GRISOGONO. Driven by a continuous urge to anticipate trends without fearing to stray from the beaten track, Fawaz Gruosi restored the prestige of black diamonds, which had been neglected by jewellers for decades. Indeed, he discovered a 190 carat gem called “Black Orlov” as he came across it by chance whilst reading. Fawaz Gruosi was literally fascinated by this black diamond. He then decided to dedicate to it an absolutely unique jewellery collection, which met with rapturous acclaim. Only three years after its launching, the per carat price of the black diamond literally exploded on the precious stones market – quite an unprecedented event! Today, these black diamonds adorn necklaces, earrings, rings, and bracelets, wonderfully enhancing voluptuous pearls, blazing rubies, deep emeralds, or quite simply white diamonds. Encouraged by his unexpected success, Fawaz Gruosi kept trusting his instincts. His jewellery creations, recognizable amongst thousands, seduced the customers and surprised the professionals. In 2000, after acquiring considerable experience as a jeweller, Fawaz Gruosi chose to enter the world of watchmaking and presented his first-ever watch at BaselWorld. He called it Instrumento N°Uno. It was only the first in a series of successes. Thanks to Fawaz Gruosi’s inventiveness, the de GRISOGONO company launched 23 watch collections between 2000 and 2008, all distinguishing themselves on exclusive and original designs. At the same time, de GRISOGONO’s jewellery collections were enriched with new designs using stingray (galuchat), opalescent diamonds – “Icy Diamonds” – or a new shade of gold with a brown glint called “Browny Brown Gold”. All these inventions have been praised by the customers and are a testimony to Fawaz Gruosi’s insatiable inspiration. Fawaz Gruosi has always been inventive. Neither gemmologist nor designer, he owes his success in the first place to his passion and curiosity and, no doubt, to his genuine creative talent. Avoiding fashionable gimmicks, he plays with trends, sometimes against the tide, only listening to his inspiration. “Everything I see around me, in nature or in everyday objects, is a source of inspiration”, he confides. He trusts his intuitions, always refusing to give way before what others would deem impossible. He follows no commercial rules, and still succeeds in everything he does. A hard worker whose uncompromising, demanding nature is here to serve the highest standards, Fawaz Gruosi willingly admits to being impatient. “I like reactivity, I want things to move fast”, he confides. “The people who work with me must accept that”. Also, he never takes a holiday! “ I find it very hard to relax, some people even think that I am a maniac”. He also has very few spare-time activities, but many passions, such as dogs, good wine and good food; alas, too often unquenched, due to a lack of time. Still he manages to keep some spare time for his daughters, Allegra and Violetta. Fawaz Gruosi is also on the watch when it comes to acquire antiques – preferably Florentine – or works of art. “As far as my collections of objects or paintings are concerned, I trust my intuition, as for everything else. It doesn’t matter whether it is a classical or a contemporary piece, I am simply an aesthete.” An implacable truth that has been evidenced for 15 years, through the watch and jewellery collections by de GRISOGONO, revealing with every piece the daring passion of their creator.